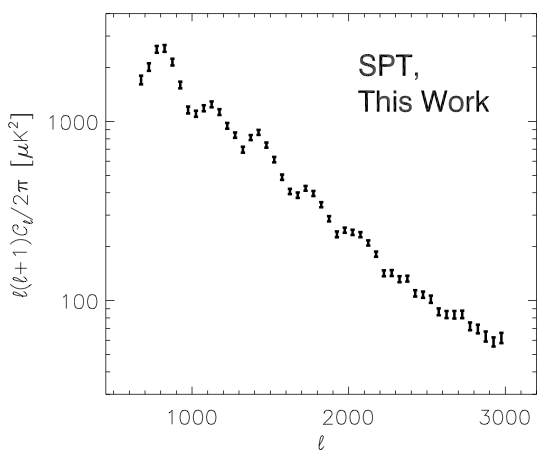 This page provides data products associated with the SPT measurement of the CMB power spectrum described in astro-ph/1105.3182, Keisler et al 2011. The power spectrum is presented over the multipole range 650 < ell < 3000 and can be used to refine cosmological models. If you have any questions regarding this data set or its use, please contact Ryan Keisler (rkeisler_at_uchicago_edu). Individual figures are available in PDF format here or bundled in a ZIP file here. Below we show a couple of example figures. These are the SPT 150 GHz Bandpowers from 2008+2009 observations. The bandpowers cover the multipole range 650 < ell < 3000. The prior on the amplitude of the SZ (tSZ+kSZ) component (template) is D3000 = 5.5 +/- 3.0 uK^2. The prior on the amplitude of the Poisson point source component (template) is D3000 = 19.3 +/- 3.5 uK^2. The prior on the amplitude of the clustered point source component (template) is D3000 = 5.0 +/- 2.5 uK^2. The foreground amplitudes are also required to be positive. The bandpowers, covariances and window functions are here in a gzipped tarball. Each row is one ell-bin. The columns are (1) ell_center (2) bandpower for 150x150, (3) bandpower uncertainty for 150x150. Each ell bin has the same width: 50. If you have any questions regarding this data set or its use, please contact Ryan Keisler (rkeisler_at_uchicago_edu). As described in Keisler et al, the baseline model assumes a spatially flat, LCDM cosmological model. Neff is fixed to 3.046 in all models except for the LCDM+Neff models, in which case Neff is free. The primordial helium abundance is calculated using the PArthENoPE BBN code (Pisanti et al 2008) in all models except the LCDM+helium model, in which case Yp is free. In the LCDM+helium+Neff model, both Yp and Neff are free and independent of each other. 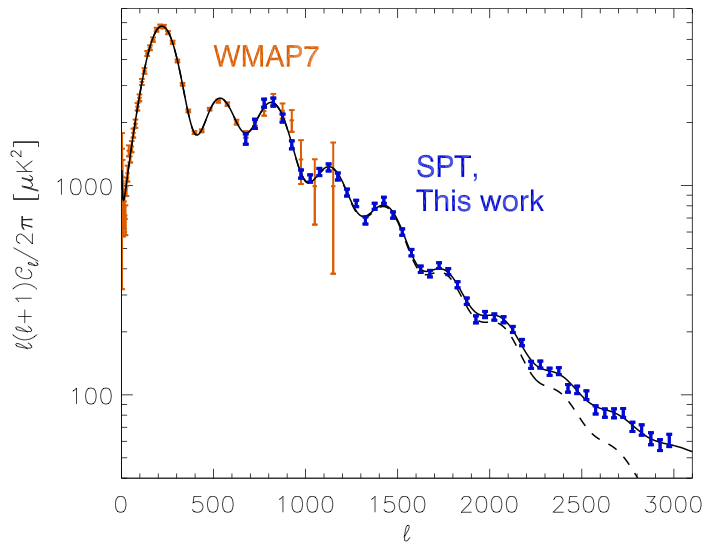 We provide versions of certain cosmoMC + CAMB files that have been modified to interface with the CMB data presented in the SPT paper, "A Measurement of the Damping Tail of the Cosmic Microwave Background Power Spectrum with the South Pole Telescope", Keisler et al, 2011 ("K11"). The code will automatically marginalize over the three foreground components described in K11 and allow the user to explore constraints on the lensing amplitude, the primordial helium abundance, and the effective number of relativistic species. This is not the exact likelihood code used in K11, but the differences in parameter constraints are not statistically significant. We provide only those cosmoMC/CAMB files that were modified. Please read the README before using.